Vr (P68R) – Ameravia Inc.
Vr (P68R) is the new alternative in light-twin aircraft. • Proven long-lasting service life (over 17,500 hrs.) and the experience of over 450 aircraft operating in all areas of the world. The aim of the Vr (P68R) is to offer a faster, lighter, more advanced aircraft for private use and for flight-training applications. 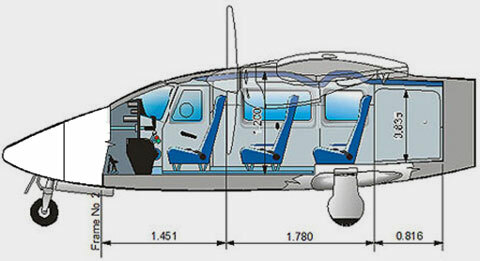 Special attention has been taken in improving an avionic suite, overall comfort ergonomics and style of the cabin. Max Take-Off Weight 4548 lb. Max Landing Weight 4321 lb. Std. Empty Weight (std. equipped w/ avg. options) 3198 lb. Service Ceiling 2 Engines 20000 ft.
Service Ceiling 1 Engine 5000 ft.
Take-Off Distance over 50ft, MTOW, ISA 1415 ft. Landing Distance over 50ft, MLW 1560 ft.
Take-Off Ground Run 850 ft. Landing Ground Run 546 ft.
Max Endurance, 4 Persons (170 lbs. ): Long Range, Cruise 55% PWR at 10,000 ft., 30 min. Res. 5.8 hrs. The new Vr is easily recognizable, thanks to its retractable landing gear, making the already attractive Italian look even sleeker. The absence of the windows in its luggage compartment gives the general aircraft appearance a more compact and sporty look. Interviews with our extensive family of enthusiastic owners and operators have confirmed the Vr as an excellent all-round performer. The new Vr has two 200 hp Lycoming IO-360-A1B6 normally aspirated engines. These engines drive Hartzell constant-speed, full-feathering propellers. The aim of the Vr is to obtain better performance in terms of airspeed, rate of climb and empty weight relative to its more utilitarian siblings in the P68C Series. The Vr, as the other models of the P68 Series, has remarkably benign handling characteristics, particularly at low speeds or in the unlikely engine failure. 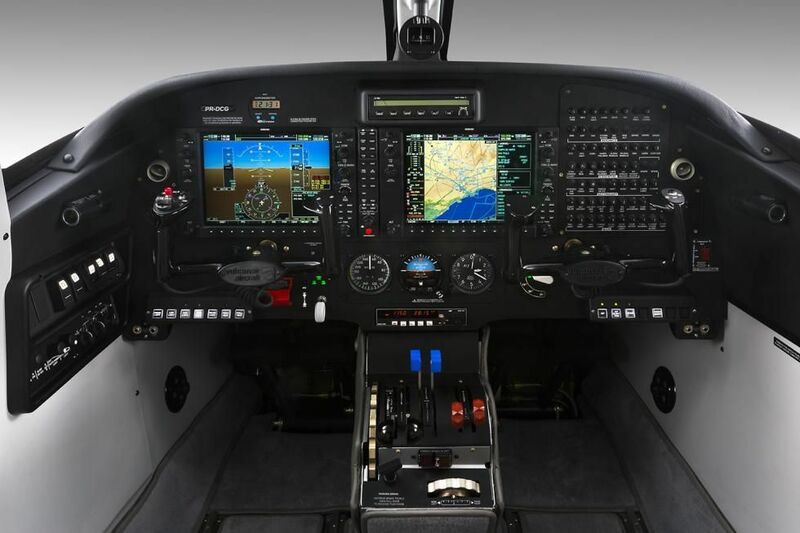 The Garmin G1000 glass cockpit is a significant improvement in terms of pilot situational awareness. A common feature of Vulcanair aircraft is economy. 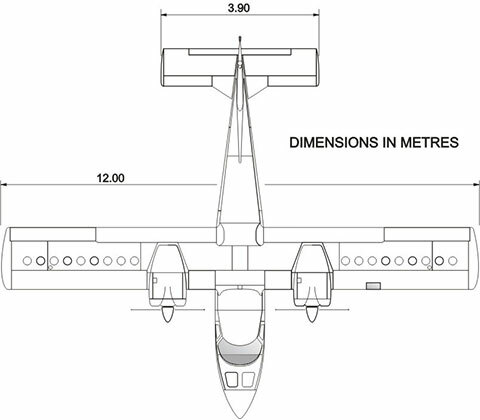 The aircraft has very low operating costs due to its structural simplicity and its proven aluminum construction. Thanks to the retractable gear, the aircraft not only gains in performance, but can now claim a specific range of 8NM/Gal at 10,000 ft. While it can be true that composite aircraft have no rivets, at Vulcanair, we believe that there are many advantages in aluminum construction. The first advantage is weight, compared to a similar structure made of aircraft certified composite materials. The second are the known and well-documented aging and fatigue qualities of aluminum structure together with the ease of repair. The Vr is designed and made in Italy. Its clean, sleek lines are accentuated by the retractable landing gear. Special attention has been taken with the Vr to improve the pilots’ and passenger comfort, along with the overall quality of the interior appointments.